A progressive young Perth earthmoving contractor has commissioned his third Toyota Huski skid-steer loader (SSL), supplied by Toyota Material Handling . 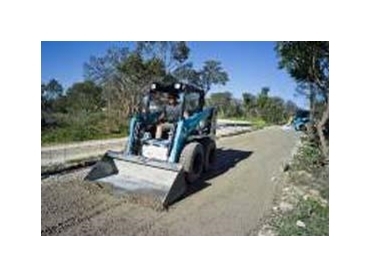 Doogs Dvorak of A Class Earthmoving specialises in hot mix work, car parks, roads and house pads. Already an owner of two Huski skid-steer loaders, he commissioned his third Toyota Huski 5SDK-8 (SSL) in August just three months after commissioning an air-conditioned 5SDK-8. The company also owns two trucks and a hot-mix roller. Doogs Dvorak founded his company in 2007 with a previous-generation Huski 4SDK-8, after learning the skills of operating the SSL from his father, Peter. Toyota Material Handling local area sales manager, Dan Rhodes convinced him to do an extended trial in the new-generation 5-Series model. Doogs Dvorak says that he was prepared to pay good money for another 4-Series because he was convinced about the capabilities of the skid-steer loader, but Dan persuaded him to take the 5-Series and operate it every day without switching back and forth with his 4-Series. Though the 4-Series was efficient, after six months of operating the 5-Series, Doogs Dvorak was completely sold on the operator-friendly machine. Doogs Dvorak is impressed with the low maintenance requirement of the skid steer loaders and after-sales support provided by Dan Rhodes including organising for setting up buckets or sourcing tyres. The Huski 5SDK-8 is one of six Huski skid-steer loader models offered nationally by Toyota Material Handling, ranging from the compact 4SDK-4 right up to the 900kg operating load 5SDK-11.